I was fortunate to attend a book signing for Mind in the Making by Ellen Galinsky in May, 2010. 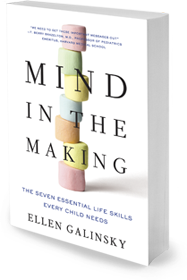 I was so inspired by the presentation that I reviewed Mind in the Making by Ellen Galinsky in the June 2010 issue of Be the Best Nanny Newsletter. The author hired New Screen Concepts to help film the experiments discussed in the book. Viewing the vook (video book) brings the research to life. By uploading the vook to your computer, i-phone, i-pod, or i-pad you can actually see how children learn, not just read about the research in black and white print. The “essential life skills” that Ellen Galinsky has spent her career pursuing, with more than a hundred of the most outstanding researchers in child development and neuroscience are: focus and self control, perspective taking, communicating. making connections, critical thinking, taking on challenges, and self-directed, engaged learning. In the video clip below you will see an experiment by Anne Renald of Stanford University. Her research shows that how families talk to children makes a big difference in how children associate sounds. The experience of hearing a lot of diverse and rich language effects the efficiency in which children learn. Playing “I Spy” is a fun way to connect Dr. Renald’s research with children’s learning. I highly recommend Mind in the Making book or the vook (video book) to inspire you to help teach children the seven essential life skills. It is great watching the video to see how kids learn. Thanks again for finding great resources.